"Spanish America" redirects here. For colonial Spanish America, see Spanish colonization of the Americas. Map of countries that make up Hispanic America, in green. Spanish speakers in the Americas. These countries have significant commonalities with each other and with Spain, its former European metropole. In all of these countries, Spanish is the main language, sometimes sharing official status with one or more indigenous languages (such as Guaraní, Quechua, Aymara, or Mayan), or English (in Puerto Rico). Roman Catholicism is the predominant religion. Hispanic America is sometimes grouped together with Brazil under the term "Ibero-America", meaning those countries in the Americas with cultural roots in the Iberian Peninsula. Hispanic America also contrasts with Latin America, which includes not only Hispanic America, but also Brazil, as well as the former French colonies in the Western Hemisphere (areas that are now in either the United States of America or Canada are usually excluded). The Spanish conquest of the Americas began in 1492, and ultimately was part of a larger historical process of world discovery, through which various European powers incorporated a considerable amount of territory and peoples in the Americas, Asia, and Africa between the 15th and 20th centuries. Hispanic America became the main part of the vast Spanish Empire. Napoleon's takeover of Spain in 1808 and the consequent chaos initiated the dismemberment of the Spanish Empire, as the Hispanic American territories began their struggle for emancipation. By 1830, the only remaining Spanish American and Asian territories were the Philippine archipelago and the islands of Cuba and Puerto Rico, until the 1898 Spanish–American War. European colonies and claimed areas in the Americas, ca. 1750. Linguistic map of Latin America. 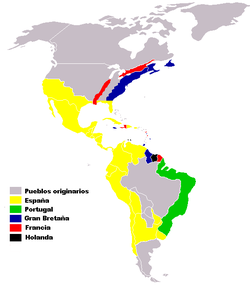 Spanish America in green, Portuguese America (Brazil) in orange, and French Guiana and French Caribbean in blue. Quechua, Guarani, Aymara, Nahuatl, Mayan languages, Mapudungun. Spanish is the official language in most Hispanic American countries, and it is spoken by the vast majority of the population. Native American languages are widely spoken in Peru, Guatemala, Bolivia, Paraguay and Mexico, and to a lesser degree, in Panama, Ecuador, Colombia, Venezuela, Argentina, and Chile amongst other countries. In some Hispanic American countries, the population of speakers of indigenous languages tend to be very small or even non-existent (e.g. Uruguay). Mexico is possibly the only country that contains the largest variety of indigenous languages than any other Hispanic American country, and the most spoken native language is Nahuatl. Other European languages spoken in Hispanic America include: English, by some groups in Puerto Rico; German, in southern Chile and portions of Argentina, Venezuela, and Paraguay; Italian, in Argentina, Venezuela, and Uruguay; Ukrainian, Polish, and Russian in Argentina; and Welsh, in southern Argentina.Yiddish and Hebrew can be heard around Buenos Aires. Non-European or Asian languages include Japanese in Peru, Bolivia, and Paraguay; Korean in Argentina and Paraguay; Arabic in Argentina, Colombia, Venezuela, and Chile; and Chinese throughout South America. In several nations, especially in the Caribbean region, creole languages are spoken. 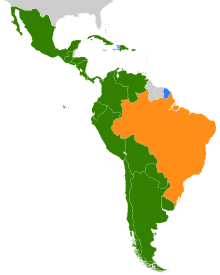 Creole languages of mainland Latin America, similarly, are derived from European languages and various African tongues. Hispanic cuisine as the term is applied in the Western Hemisphere, is a misnomer. What is usually considered Hispanic cuisine in the United States is mostly Mexican and Central American cuisine. Mexican cuisine is composed of mainly indigenous—Aztec and Mayan—and Spanish influences. Mexican cuisine is considered intangible cultural heritage by UNESCO and can be found all over the United States. In the United States, with its growing Hispanic population, food staples from Mexican cuisine and the cuisine from other Hispanic countries have become widely available. Over the years, the blending of these cuisines has produced unique American forms such as Tex-Mex cuisine. This cuisine, which originated in Texas, is based on maize products, heavily spiced ground beef, cheese and tomato sauces with chilies. This cuisine is widely available not just in the United States but across other countries, where American exports are found. In Florida, Cuban food is widely available. All of these Hispanic foods in the United States have evolved in character as they have been commercially americanized by large restaurant chains and food companies. The cuisine of Spain has many regional varieties, with Mediterranean flavors based on olive oil, garlic, and tomatoes and due to its long Atlantic and Mediterranean coastlines, has been graced with a great variety and availability of seafood. In the inland communities of Spain, there is a long tradition of cured meat of different kinds, in addition to an abundance of dishes such as roasts and stews, based on beef, pork, lamb, and poultry. The European and Arab heritage of Spain is reflected in its food, along with cosmopolitan influences beginning in the many new ingredients brought in from the New World since the 16th century, e.g. tomatoes, potatoes, or chocolate, and the more modern tastes introduced from Europe since the 19th century, especially through French and Italian dishes. It is only in the last ten years[when?] that Hispanic American dishes have been introduced in Spain. In the United States and Canada, the number of Hispanic restaurants has become a growing trend, following the tapas-style restaurants fashion that first appeared in North America in the 1990s. Cuban, Dominican, and Puerto Rican cuisines, on the other hand, tend to use a lot of pork and can depend heavily on starchy root vegetables, plantain, and rice. The most prominent influences on their Spanish culinary traditions were introduced by African slaves, and to a lesser degree, French influence from Haiti and later Chinese immigrants. The use of spicy chile peppers of varying degrees of strength used as flavour enhancers in Mexican tradition is practically unknown in traditional Spanish–Caribbean dishes. The cuisine of Haiti, a country with a Francophone majority, is very similar to its regional neighbors in terms of influences and ingredients used. The Argentine diet is heavily influenced by the country's position as one of the world's largest beef and wine producers, and by the impact that European immigration had on its national culture. Grilled meats are a staple of most meals as are pastas, potatoes, rice, paella and a variety of vegetables (Argentina is a huge exporter of agricultural products). Italian influence is also seen in the form of pizza and ice cream, both of which are integral components of national cuisine. Uruguayan cuisine is similar to that of Argentina, though seafood is much more dominant in this coastal nation. As another one of the world's largest producers, wine is as much a staple drink to Uruguayans as beer is to Germans. In Colombia, Ecuador, Peru and Chile, potato dishes are typical since the potato is originally from this region. Beef and chicken are common sources of meat. In the Highlands is the cuy, a South American name for guinea pig, a common meat. Given the coastal location, both countries have extensive fishing fleets, which provide a wealth of seafood options, including the signature South American dish, ceviche. While potato is an important ingredient in the Highlands, Rice is the main side dish on the coast. This diversity in staples and cuisine is also evident in the differing regional cuisines within the national borders of the individual countries. Flag of Hispanic Heritage. Motto: Justicia, Paz, Unión y Fraternidad ("Justice, Peace, Union and Fraternity"). While relatively unknown, there is a flag representing the countries of Spanish America, its people, history and shared cultural legacy. It was created in October 1933 by Ángel Camblor, captain of the Uruguayan army. It was adopted by all the states of Spanish America during the Pan-American Conference of the same year in Montevideo, Uruguay. The white background stands for peace, the Inti sun god of Inca mythology symbolizes the light shining on the Americas, and the three crosses represent Christopher Columbus' caravels, the Niña, Pinta, and Santa María, used in his first voyage from Spain to the New World in 1492. The deep lilac color of the crosses evokes the color of the lion on the coat of arms of the medieval Crown of Castile. ^ Values listed in km². ^ Values listed in billions USD. ^ "Hispanic America" is used in some older works such as Charles Edward Chapman's 1933 Colonial Hispanic America: A History and 1937 Republican Hispanic America: A History (both New York: The Macmillan Co.); or translated titles that faithfully reproduce Hispanoamérica, such as Edmund Stephen Urbanski (1978), Hispanic America and its Civilization: Spanish Americans and Anglo-Americans, Norman: University of Oklahoma Press. The Cambridge University Press textbook by two distinguished historians of early Latin America, James Lockhart and Stuart B. Schwartz is entitled, Early Latin America: A History of Colonial Spanish America and Brazil 1983. ^ "CIA – The World Factbook – Field Listing – Languages". Retrieved 2009-04-11. ^ "CIA – The World Factbook – Field Listing – Religions". Retrieved 2009-04-11. ^ The adjective "Ibero-American" usually refers only to countries of the Western Hemisphere, but in the title of the Organization of Ibero-American States it refers to Iberian and (Ibero-)American countries, plus Equatorial Guinea. ^ "Population, total | Data". data.worldbank.org. Retrieved 2017-07-11. ^ "Report for Selected Countries and Subjects". www.imf.org. Retrieved 2017-07-11. ^ "Demografia de Chile" (PDF). Archived from the original (PDF) on January 27, 2009. ^ "The World Factbook — Central Intelligence Agency". www.cia.gov. Retrieved 2017-07-11.